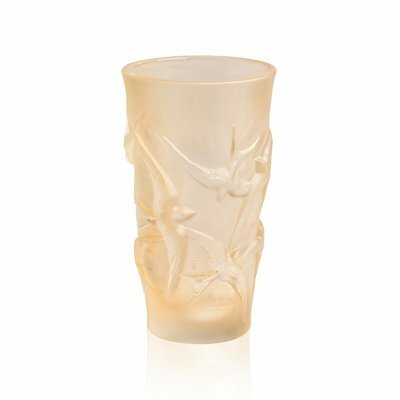 Directly inspired by a creation of René Lalique, this vase depicts the beauty of swallows taking flight. With grace and lightness, they spread their wings with finely chiselled feathers. Illuminated with gold, they twirl around, drawing the eye into swirls of crystal. This limited edition of 130 pieces majestically celebrates Lalique’s 130th anniversary. Earn up to 12,500 points. Discover Hirondelles grand vase Lalique. To celebrate the 130th anniversary of the Maison, the new collection takes us to the heart of the immeasurable heritage built by its founder. Among fauna, the swallow particularly inspired René Lalique, which he then made the centrepiece of many jewels and decorative objects.